Girl Scouts Beyond Bars troop members visited two local universities last week and left excited about the possibility of going to college. 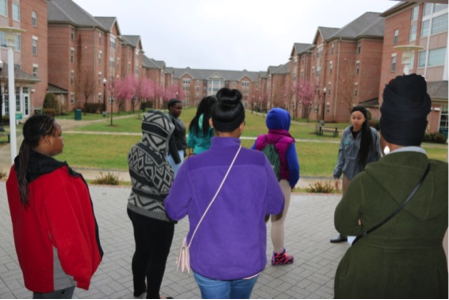 At Stevenson University’s Owings Mills campus, the middle and high school Girl Scouts visited classrooms, athletic facilities, study lounges, and dorms. They enjoyed lunch in a campus cafeteria with a wide array of choices — from pizza and burgers to jerk chicken and all kinds of salads. 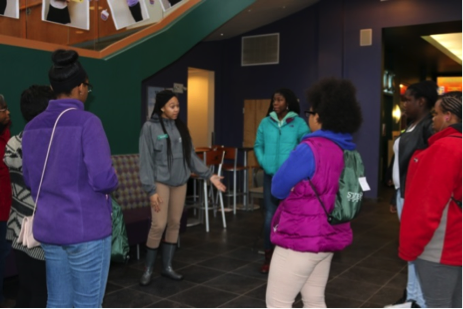 Stevenson senior Raven Belford and junior Revae Boykins gave a comprehensive tour, making the Girl Scouts feel welcome and sharing their insights about college life. Both young women were engaging, knowledgeable and relatable. Raven Belford and Revae Boykins (facing camera) give Beyond Bars Girl Scouts a tour of Stevenson University. Raven and Reyae lead the girls on a tour of the residence halls on the campus at Stevenson University. “I LIKE this college!” said one of the Girl Scouts toward the end of the tour, as others nodded in agreement. Receiving Stevenson backpacks and T-shirts made them feel even more a part of the college community. The girls left Stevenson very impressed by the school’s people and facilities. The Girl Scouts Beyond Bars program was designed to give girls a chance to maintain and strengthen relationships with their mothers, who are incarcerated at the Maryland Correctional Institution for Women. In addition to troop meetings held at the prison, the program offers other troop activities, such as camping and this college tour. From Stevenson, the group travelled to Baltimore to Notre Dame University of Maryland, for a campus tour and information session. A highlight of the tour was the school’s nursing simulation lab, with its computerized mannequins that mimic symptoms, giving students more realistic training in patient care. 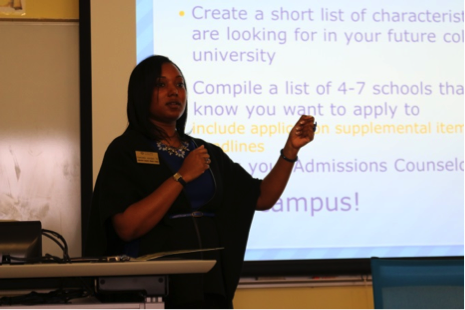 Then, Admissions Counselor Danielle Jordan explained steps for selecting a college, the application process, and various types of financial aid. She noted that through grants, scholarships, work-study and loans, almost all Notre Dame students receive financial aid to help cover the school’s $40,000 tuition. 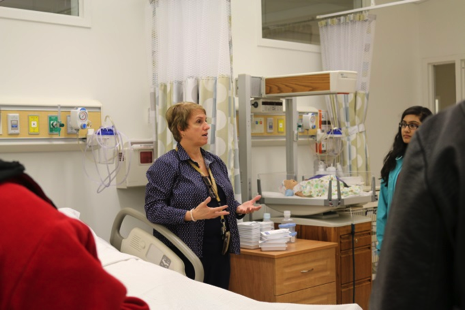 An instructor describes features of Notre Dame’s nursing simulation lab. Notre Dame Admissions Counselor Danielle Jordan talks about selecting a college. The feedback from those who attended the tour was so positive that the Beyond Bars program is likely to arrange visits to other local institutions of higher learning in the years to come. We hope that future tours go as well as this first one did!